This is one of the older posts that I am moving over from Make Stuff With Your Kids. A friend got me interested in archery. I did this with my dad and my uncles when I was younger but haven’t thought about it in years. 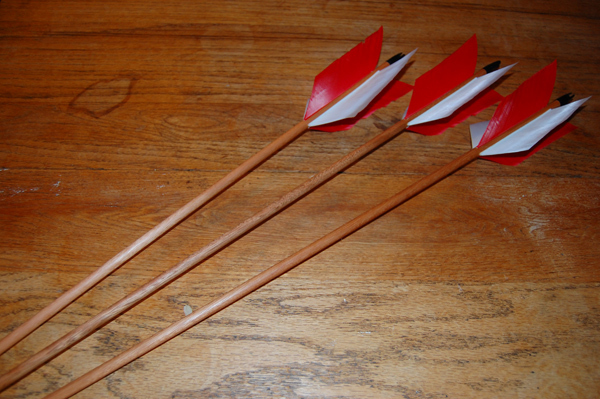 Of course, it is more fun to make all the arrows myself. After a time, I experimented with several other arrow types, here is my favorite. 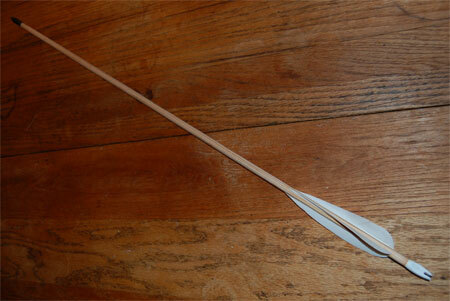 These are called flu flu arrows and are for shooting targets up in air or in trees. The hafts are homemade from some lyptus scraps a friend brought me from his cabinet shop. Clicking on the pictures will make them larger. This entry was posted on February 28, 2010 at 4:52 pm and is filed under Archery. You can follow any responses to this entry through the RSS 2.0 feed. You can leave a response, or trackback from your own site. Hi: what size Round Over Bit do you use. Can you make 5/16″ 11/32″ and 23/64″ arrow shafts with the same bit. I use a 1/2″ bit for every size arrow. I only think it would matter if it was too small. Since the shaft is rotating in the drill, I don’t think the size matters too much. You could probably use a straight bit and it would work. I think that the roundover might make it a bit easier to get a smooth shaft though. If you make some, send a pic.